It is such an honor to share with you my Amazing Adventures! In the coming weeks and months you will be discovering my journey as I Clown around Montréal, and beyond through the Internet. These are my stories of love, humour, vulnerability, kindness and caring. A lot of fun is going to happen, mixed with philosophy and pushing my boundaries beyond my comfort zone. I hope to inspire you to take risks, to laugh along with me and to discover how much love and caring is within all our reach. Let me offer you these three kind words : ”I love you”, know that I am here for you, and as they say, we are all in this together. My name is Guy Giard and I was born and raised in Montréal, Québec, Canada. Like any good cheese or fine wine and chocolate, patience and time will make you discover my journey. As I am nearing my 55th birthday my life has become quite a thick novel made of many chapters of plot twists and unexpected turn of events. 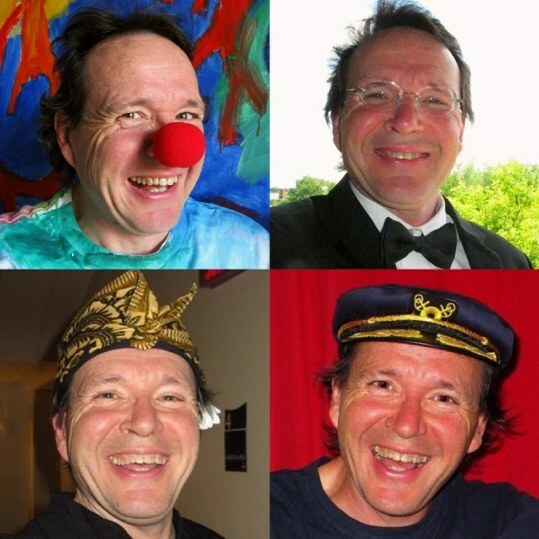 There are Guy the artist with more than 30 years of art making, including many noteworthy exhibitions, Guy the teacher, Guy the musician, Guy Les Chants Marins de Montréal, Guy the lecturer, Guy The Healthy Paleo Guy with my blog on nutrition and exercises, and Guy the Humanitarian Clown. 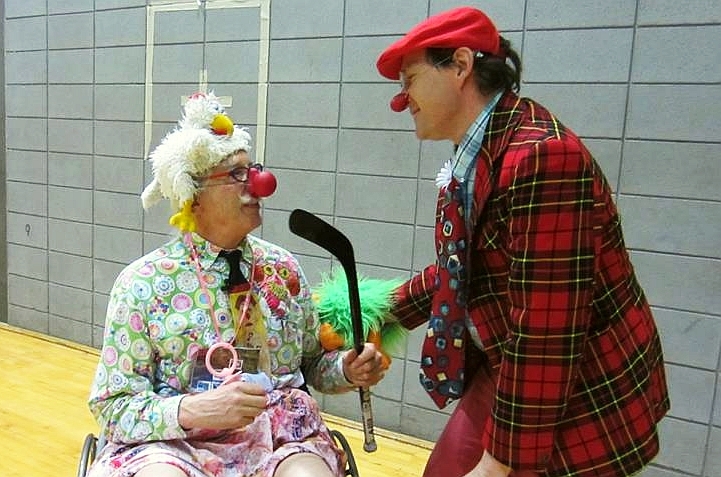 Presently back in Montréal I offer you Guy the Citizen Clown (in homage to one of the greatest movies of all time). You can always visit my websites to explore any of the Guys above : www.guygiard.com, my YouTube Channel, my Guy The Healthy Paleo Guy blog. You can also subscribe to this blog, and invite you to join my Facebook’s The Amazing Adventures of Citizen Clown Fanpage. This blog wouldn’t have seen the light of day without the loving hearts and encouragement of many Midwives. Without any specific order, (and you will discover more about them in the coming months), I’d like to thank all my AATH family, especially Mary Kay, Barbara, Lenny, a priest named Paul, Harald and too many others to name here. Just watch the 2014 Conference video to get a feeling of what I’m talking about. There are all the positive vibes of the participants at the 2013 Canada Laughter Yoga Conference, Duncan and Linda you are Amazing!!!! There is Linda and Liliana de Leo who was my teacher when I became a Laughter Yoga Leader. Francine Côté et Geneviève at the amazing École de Clown et Comédie where I met among others Marie-Hélene. There are my friends at the Montreal Laughter League and at the Club de rire de Montréal. I also have to underline the support and positivity of Douglas and Monika at YES Montreal; I don’t know where I would be without them! I’ve been blessed with the support of more than 50 loving souls who donated funds to help me get to the families and childrens in Guatemala; most notably Josée, Barbara, Maia, Harald, Tracey, Naum, Julia, Linda, Dominique, and Dre Cyr and her team. A very special heartfelt thanks also to Deirdre, Louise and Piera. Lastly, there are all the dreamers, revolutionaries and anarchist who believe that not only we can think outside of the box, we can also live there too. So Patch, you dream is a reality for me and for so many others, like Tim, Diana and Guillaume, and words can never express enough how lives are transformed through your gift and inspiration. Well said “Pic.” Being the person inside the clown sounds like a blessing to me. 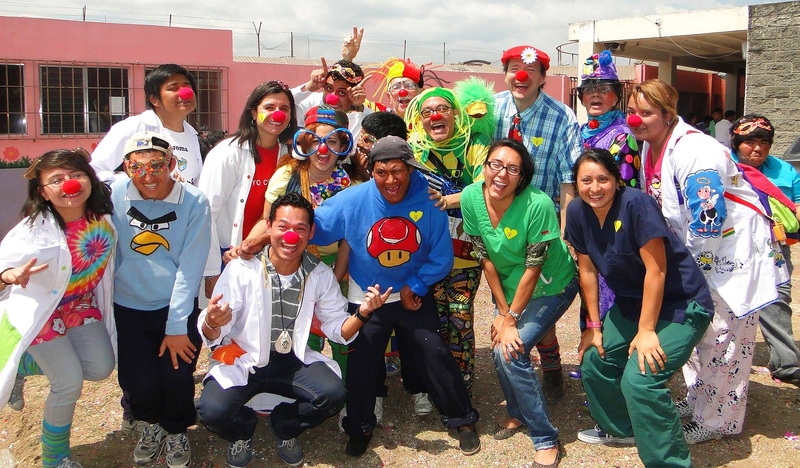 I’m thinking being the clown inside the person is good too… but that’s coming from me, as a non-clown aficionado. “Looking” forward to the share!